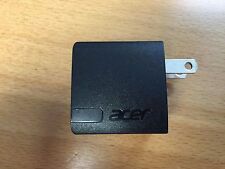 New original Acer Iconia Tab black tablet ac adapter charger & plug. Input: 100-240V, 50-60Hz. Output: 12V - 1.5A. This adapter has a round tip and only works with the models listed below. Part #'s: KP.01801.005, KP.01801.009, AP.01801.001, HU10104-11295, 2-515-5305, R33030, ADP-18TB C. Compatible Models: Acer Iconia Tab W3-810, W3-810P, Acer Aspire Switch 10 SW5-011, 10 SW5-012, 10 SW5-012P, 10 SW5-015, 11 SW5-111. New Acer laptop ac adapter charger. This power adapter is 10 watt, 5V, 2A. Compatible Part #'s: 25.G53N5.006, KP.0100A.001, PS12H050K2000UD. Compatible Models: Acer One 10 S1002. Acer Iconia One 7 B1-780. Acer Iconia One 10 B3-A30. Acer Iconia Tab 10 A3-A40, A3-A50. Acer One 10 S1003. Tablet Parts & Accessories. Laptop Keyboard Skins. Cord - XZ.70200. Laptop DC Power Jacks. 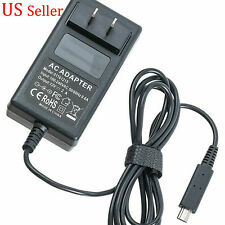 New Acer tablet ac power adapter charger cord. Input: 100-240V, 50-60Hz, 0.5A. Output: 5V - 3.0A. Compatible Part #'s: 25.LCTN5.001, 25.LCTN5.002. Compatible Models: Acer Switch One 10 SW1-011. New original Acer Iconia Tab black tablet ac adapter charger & plug. Input: 100-240V, 50-60Hz. Output: 12V - 1.5A. This adapter has a round tip and only works with the models listed below. Part #'s: KP.01801.005, KP.01801.009, AP.01801.001, HU10104-11295, 2-515-5305, R33030, ADP-18TB C. Compatible Models: Acer Iconia Tab W3-810, W3-810P, Acer Aspire Switch 10 SW5-011, 10 SW5-012, 10 SW5-012P, 10 SW5-015, V10 SW5-017, V10 SW5-017P, 11 SW5-111. Acer Iconia Tab A100, A200, A210, A500, A501. Input: 100-240V, 50-60Hz. Output: 12V - 1.5A. This adapter has a round tip and only works with the models listed below. Tablet Parts & Accessories. Laptop Keyboard Skins. IPhone 7, 6, 6s, 6 plus, 5s, 5c. Supports syncing and charging. (Does not play music or work with docking station) and is not made by APPLE. FREE " Anti dust plugs Dock Cap Cover & earphone Cover for iphone 6 x 2pcs ". Acer Iconia Tab AC Power Supply- Travel Pack (Black). A500/ A501/ A200/ A100/ A101. AC Power Supply Input: 100-240V~0.5A, 50~60Hz. Output: 12V-1.5A. Manufactured in China. This item is brand new in box. Item does contain shelf wear. Item in good condition, as shown in the pictures. This item ships USPS First Class Mail within 24 hours of payment. Compatible: Acer Iconia Tab A510 A700 A701 Tablet. Cable length: 140cm. This excludes: Alaska/Hawaii, US Protectorates and APO/FOP. Policy for one more life electronics of New York. We hope you understand. Compatible: Acer Iconia Tab A510 A700 A701 Tablet. Output: 12V 2000mA. Cable length: 140cm. Laptop Keyboard Skins. Tablet Parts & Accessories. Laptop DC Power Jacks. The guidelines are below. Laptop Cpu Fans. Laptop Batteries. Compatible Part #'s: KP.04503.007, KP.0450H.009, PA-1450-78AP. An extra adapter to keep as a backup ensures that you're always powered up and ready to go. Travel the world with your Iconia Tab. 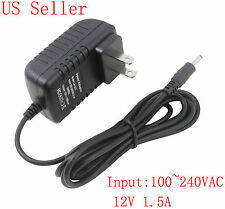 Genuine Acer A500-p01 Ac Adapter - 12 V Dc For Tablet Iconia(7a) A4. Iconia Tab A100 A101 A200 A210 A500. One AC adapter. Compatible adapter model. Connctor size: 3.0mm 1.1mm. Compatible Model. Output: 5V 1.0A MAX. Grade D: Only good for parts or repair (see notes above). Grade B: Used with minor signs of use (light scratches/scuffs). Grade A: Used with minor to no signs of use. Acer Iconia Tab AC Power Supply A500/ A100 Seires: 3 Pack. Input: 100-240V-0.5A, 50-60Hz, Output: 12V- 1.5A, and manufactured in China. These items are new in box. Packaging have significant shelf wear. All items included in good condition, as shown in the pictures. This item ships USPS Priority Mail within 24 hours of payment. ANYTHING NOT SHOW IN THE PICTURES OR LISTED IS NOT INCLUDED. Grade A: Used with minor to no signs of use. Grade B: Used with minor signs of use (light scratches/scuffs). A500 / G100 / A501 / A201 / A210. A200 / A100 / A101. ORIGINAL Acer Iconia power. Output 12V 1.5 A. Connector / 3.0 mm x 1.0 mm tip. Need to change the hard drive?. La TVA (19,6%) est récupérable pour les professionnels. Color: Blanco. Largo: 6' pies. Diseño de conector de base delgado que permite su uso con dispositivos sin quitar la caja. y trabajaremos con usted para resolverlo a su entera satisfacción. Cable de acoplamiento de 30 pines certificado por Apple MFi y utiliza un conector original de Apple. Color: Blanco. Largo: 4' pies. Diseño de conector de base delgado que permite su uso con dispositivos sin quitar la caja. y trabajaremos con usted para resolverlo a su entera satisfacción. Cable de acoplamiento de 30 pines certificado por Apple MFi y utiliza un conector original de Apple.